HAVERFORD — Norma DiCocco, co-founder of the St. Jude Shop in Havertown, bears special devotion to St. John Neumann after experiencing what she believes was a miracle 30 years ago.It was then that a dangerous heart abnormality threatened to take the life of her 10-year-old nephew. Doctors gave him six months to live.DiCocco turned to priests at the National Shrine of St. John Neumann. The priests suggested holding a special mass over the beloved saint’s body, enshrined in a glass casket under an altar at St. Peter’s Church in Philadelphia. About a week after the family had gathered to pray, DiCocco’s sister took her son to the Mayo Clinic. Doctors there encouraged the family to try a promising surgical procedure.When DiCocco’s nephew came out of the operating room, his lips were no longer tinged with blue, and her sister knew he’d recover. 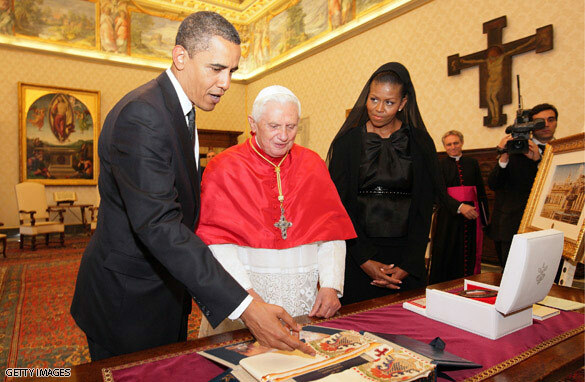 Now 46, he is married and has a family.So DiCocco is thrilled beyond words to have played a role in President Barack Obama’s presentation to Pope Benedict XVI of a stole once placed on St. John Neumann’s remains. President Obama presented the relic when he exchanged gifts with the Pope during a visit Friday, following a three-day summit with world leaders. The State Department consulted the DiCoccos for a gift suggestion prior to the president’s visit. In addition to fostering spirituality with books, gifts and music, the DiCoccos maintain a liturgical arts studio renowned for the design, construction and restoration of church interiors.Officials at the Basilica of the National Shrine of the Immaculate Conception in Washington, D.C., contracted the studio last year to design a chair for Benedict’s visit in April 2008. Norma DiCocco’s son and president of St. Jude Shop, Inc., Louis DiCocco III said, “The people in Washington remembered and contacted us to help them with a gift the president could provide the Holy Father.”Although an antique chalice was on the list of possibilities, the DiCoccos realized something more historic was in order. They reached out to friends and institutions in the region, including the Redemptorist Fathers, an order of priests from St. Peter’s Church, to which St. John Neumann belonged.”When St. John Neumann was re-dressed there was a stole he had on, which they suggested would be appropriate for the president to give the Holy Father,” Louis DiCocco said. Born in Bohemia in 1811, St. John Neumann “came here and started over 38 Catholic schools and took care of immigrants who had nothing. His life was a direct reflection of Catholic history in Philadelphia and America,” Norma DiCocco said.”St. John Neumann started as a simple, humble immigrant and later became a saint. 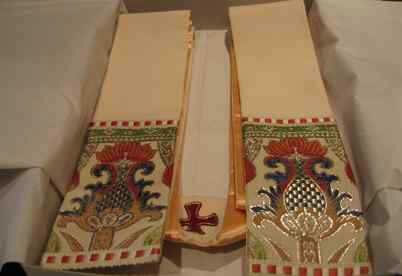 What better gift to give than a piece that was worn by him, an immigrant who helped Catholic history flourish here in Philadelphia,” said Louis DiCocco. Apparently, the president agreed.